From the color to the shape, from the shape to the drawing, from the drawing to the line, from the line to the oval, and so on. That’s the continuous rhythm produced by Mario Vélez’s artworks. He is a Colombian artist that gives a big cromathic strengh to his paintings in spite of his formal simplicity . 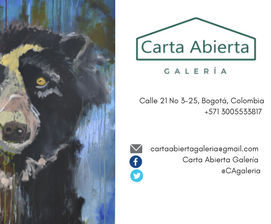 To appreciate the artworks of Carlos Mario Vélez, you have to going back to the basic essence of painting: supports with color drawings, textures, simple geometric figures where prevail elliptical figures, lines and traces. These are simple shapes that doesn’t hide another meaning, keeping aside the main one. For this reason, the compositions are poetry for itself. The sutil movements and the continuous flow produced by the figures. They are dancing to the rhythm of colors; a dance where everything is connected and goes back to the circle. Among the repeated elements inside these cromathic background, the prevailed figures are ellipsis or oval, that look like germinating seeds in Vélez’s paintings. His artworks bring a sensation of blossoming and new energies thanks to the oval figure and the mix of colors. Mario says that paiting is “a permanent project that requires courage and intuition. It must be the manifestation of something powerful in a intelectual, spiritual and artistic level. The act of painting makes me feel like in a enclosured area or a sanctuary where you can stay there and give your effort and vitality (…). Painting implicates an exclusive relationship between the artist and the artwork. Loneliness is the key in painting, helping you to be more concetrated in what are you doing and the key in the creation of my plastic project”. His pictoric infuence started in the period of German artistic development in the 90’s and branded by the German expressionism. Mario studied with the artist Karl Hörst Hödicke, a creator of neo-expressionism, who connects him with the abstract art of New York. At the same time, Manuel Hernández is other well-known artist inside the Colombian area. So, the artwoks of Vélez are mainly influenced by three artistic movements: the shapes and figures of pre-Columbian cultures, the lenguaje of abstraction and the color of expressionism. However, his painting doesn’t have the crude nature of these artistic movements. The energy and free movements related with the expressionism are replaced with precise and careful traces, all separated by every cromathic area, every shape and outline. The movement suggested is delicate, creating an harmony and a balance inside the compositions. There is no spots and the brush stroke is limited for the figures or background. The route of the brush isn’t left there, in the artworks. But we can notice the quality of visual textures reinforced with the coat of pain. Mario Vélez is a colorist. His several paintings pass through the energy of the shades in its different temperatures. Some artworks are based in pastel and soft colors. Other artworks have the power of saturation and contrast. It is the same case with the “cold or hot” paintings, that suggest a season. For example, we have the serie Eterna primavera, made in 2011. There, the artist expresses the power of colors in its energetic and vibrating condition. Seeds weave among them. At the same time, they float to the support with a fun and happy temperament. Among the recent artworks of Mario Vélez, we have Canto rodado (2014). The serie, in a big format, repeats the mencioned elements previously. But in this case, the seed turns to an egg, making a pseudo-bunch that navigates, expands and contracts it in all directions. Canto rodado left the fun of the previous serie, to load the atmosphere with geometrical figures and space. We could see this reading the name of some titles: “Continuous cosmic wave”, “Breaking Solar forms”, “Planetarium”, “Astral space”, “Stellar silences”, “Universes coexisting”, “Black hole”, among others. 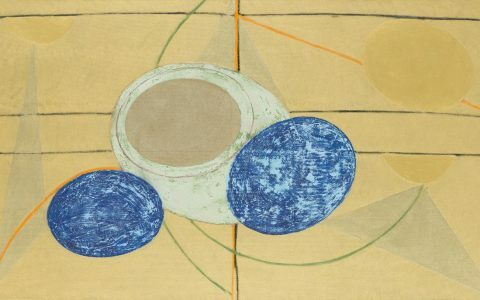 On the other hand, colors turned more dark and geometric figures acquire more importance: circles, squares and triangles organized the weight, the directions and movements in a compositional level inside the images and it’s represented for these “cosmic eggs” that express the universal events. All these elements are precisely balanced and suggested by Vélez: full of balance and harmony in a continuous movement. Cuadrantes is a serie created in 2012, made for an event in tribute to John Cage. In this project, Mario established a relation between musical instruments and color elastic bands used in the work. The project had the peculiarity of being an opportunity to investigate about the tridimensionality and stop to use the previous bidimensional technique, with a main characteristic: use large color surfaces. However, Cuadrantes keeps the graphic structure of drawing used in their previous works, but applying different techniques and materials. It gives a rough and non-organic appearance to the work, in comparision of the last works that are in movement permanently. Nowadays, the artist is working in a new project called Cronotopo. 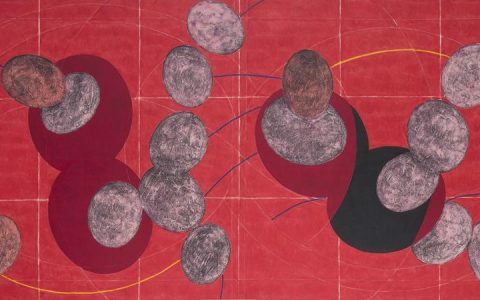 Vélez says that its objective is “take the elements from the drawing, such as the color, shapes and traces, to the reality. The point is surround the viewers with a painting-precinct where they can step, touch and fill it”. The concept and limits of painting transcend to be more close to the installation itself. It could be an interesting challenge in his artistic career because he maintain the essential concepts on his paintings, linked to tridimensional areas and a esthetic related to the viewer.